Bonus Hunting and Casino Bonus Abuse – Can It Still Make Money? Bonus hunting, bonus whoring, casino whoring, bonus abusing. All of these terms describe the activity of players who try to make money in the long run by using bonuses offered by online casinos. And many of them were and are still successful, although this practise is getting harder and harder to pull off as time goes by. Are you curious how casino bonus hunting works and whether you can use it to make money in online casinos in today’s environment? You’re in the right place to find that out. Why used bonus hunting to be such an easy way to make money in casinos in the past? What changed and make it much harder to use in real life? How to overcome the limitations and use bonus hunting successfully even today? What’s the best bet size to use when playing with bonus money? With computer simulations. And most importantly… Can you do it, too? In the past, bonus hunting was relatively easy, because online casinos’ bonuses were big, had low wagering requirements and no restrictions on allowed games. That meant that players could just use the bonuses and rely on their positive expected values to make a profit in the long run. Let’s say a player got a $200 bonus with WR of 25x. He is trying to meet the WR by playing a slot game with RTP of 98 %. Therefore, the casino has a 2 % edge, which means that the player statistically loses 2 % of every bet he makes. The expected value of a bonus in this case is $200 * (100 % - 25 * 2 %) = $100. That’s pretty much how it used to work. Unfortunately, bonuses like this are a thing of the past. Nowadays it’s completely different. Casinos have improved their calculations and generally don’t offer bonuses that can be cleared with profit with such ease. However, that doesn’t mean that players can’t still use casino bonuses to make money. It’s much more complicated though. If you're wondering how to make money gambling online, the method I'm about to describe might present a good answer. However, keep in mind that it's definitely not for everybody. Bonus hunting nowadays is based on high volatility and requires a big bankroll, willingness to spend a lot of time and strong nerves to overcome losing streaks that are unavoidable with this kind of a strategy. Make a deposit and get a bonus. Start playing very aggressively. Choose a slot with high variance and play until you hit a big win or lose everything. If you lose everything, you have to move on and get a bonus at a different casino. But if you win, you should have a big enough buffer that should allow you to comfortably meet the WR of your bonus and cash out. You have to repeat this strategy numerous times in order to be profitable. Of course, you can be lucky the first time, however, you can also be unlucky and still be losing money after 100 tries. For the 96 % RTP slot I used in my simulations, the probability of being in the reds after 100 bonuses is still a bit over 30 %. After 500 bonuses, it drops to 7,5 %. So, even after 500 bonuses, there is still a chance to be in red numbers. Although, that doesn’t change the fact that this strategy is profitable in the long run. However, there are still bonuses that can easily be cleared with profit, even in the current state of online gambling market. No deposit bonuses and freebies can be used to make money, albeit very little of it. They don’t cost you anything and you can get a few bucks out of them. This was a short summary of the entire article about bonus hunting. I wanted you to have a basic overview of the topic before getting started with the detailed information and instructions supported by simulations you can find below. Enjoy! Let’s start with how it all began. Bonus hunting reached its peak between 2000 – 2006. The online gambling industry was new. Awareness of all the gambling math formulas wasn’t that high among casino managers and so many casinos offered high bonuses with low wagering requirements (WR) and no restrictions on allowed games. Finding a 200% bonus with 25x wagering requirements was quite common. 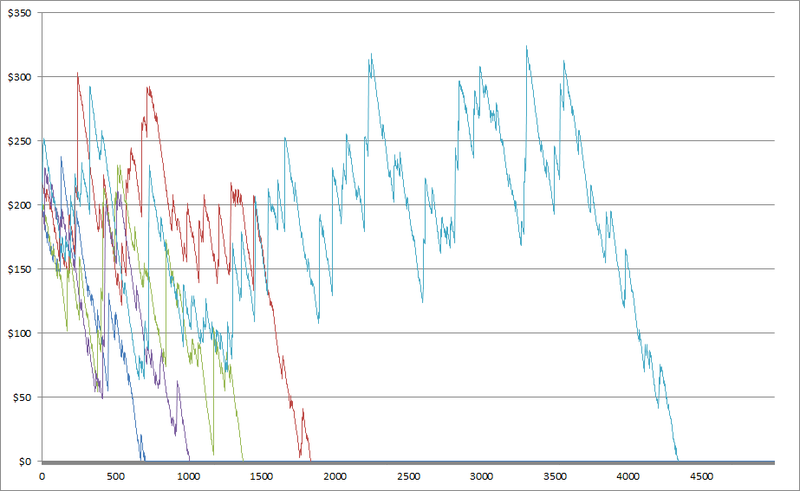 The following graph displays the budget over time for players playing $1 bets on either black or red on French Roulette. With a $200 starting bankroll and wagering requirements of 20x, after turning the bonus over you can expect to end up with 46% of $200 which is 92 bucks. In the graph you can see I did 5 runs and each is marked with a different color. You can easily see that each of the players would comfortably rollover his bonus ending up with $80 up to $150 in his account. Many casinos were making nice profits anyway and were afraid of offering lower bonuses than their competition. Startups (which casinos were that time) tend not to worry about a few bucks here and there if they have hands full with the task of growing and making money. Contribution to wagering requirements was decreased for games with higher RTP. For example, Blackjack often contributes to meeting WR only with 5% of the bet or doesn’t contribute at all. Wagering requirements were increased to more than 40x for standalone bonuses and to more than 25x for bonuses bound to the original deposit. Funny fact: the 3rd mentioned condition is absolutely not needed if the former 2 are applied but as a relict is still present in bonus conditions of many casinos. Casinos had to react, because players kept looking for instructions how to make money in online casinos and how to make money from online casino bonuses. The situation in the past allowed them to win big money in the casino, which, of course, wasn't good for the casinos themselves. After year 2006 the awareness of bonus hunting among casino managers significantly increased and now it’s extremely rare to find a bonus with a positive expected value. The best bonuses had an expected value close to 0. Due to RTP of around 96% and medium variance all 5 players hit the ground far before reaching the 10 000 spins required to meet WR. Even the best bonuses offered by casinos have a positive expected value of close to the deposit even if played on 98% RTP slots. That is the main reason why bonus hunting based on positive expected value is history. But don’t be disappointed. There are still 2 other viable options for how to hunt for bonuses in online casinos. Do you remember from history lessons how paleolithic tribes were classified either as hunters or gatherers? No deposit bonuses are closer to bonus-gathering than bonus-hunting. Don’t expect big prey but at least an animal won’t wound you. The gambling community calls these guys freebies. No deposit bonuses are small bonuses given by casinos usually as a reward for registering a new account. The most common forms are free spins and free cash. You can play with these bonuses and win some limited amounts of money. Do this in 200 casinos and with a little luck you’ll end up with a few hundreds of $. Free cash and free spins are offered as a form of marketing. If you are from a rich western country, you’ll get some kind of no deposit bonus in every second online casino. If you are from Russia or any other country famous for bonus abusing you’ll have problems to find them. I was trying hard and was barely able to fill the first page of no deposit bonuses for Russian players. So how should you collect these kinds of bonuses? The first thing to do is that you have to find casinos which will give you a no deposit bonus. My list of no deposit bonuses is the perfect place to start. Then you have to sign up. Keep in mind that these bonuses are a kind of trade between you and the casino. To get the bonus you need to provide your personal details, email address and sometimes phone number. To get paid if you win you’ll need to prove that these details are correct, send your ID and maybe even make a deposit as another form of verification. That’s how casinos protect themselves from giving the bonus to the same players over and over. Note: Please don’t create more than 1 account in 1 casino! You’ll never ever get paid anyway and you can piss the casino off and they may stop giving this bonus in the future. When I asked affiliate managers why they don’t want to give bonuses to players from certain countries, they replied that they had a lot of players from some countries with 10-20 accounts. They didn’t have to pay for any wins but they had to pay to the game provider for the free spins anyway. So you have signed up and validated your email address and phone number. Sometimes you’ll need to ask for a bonus on live chat or provide some sort of bonus PROMO CODE. Now you have a bonus. How do you play it the most effective way? Step 1: With free spins you don’t have many options. Just spin with predetermined bet size and see what you win. When you finish the free spins, you’ll actually end up with something similar to a free cash bonus. The key is in finding a good balance. With too aggressive a strategy you’ll waste almost immediately 98% of your bonuses. For the remaining 2% you’ll end up with quite a big bankroll, but you’ll be hit with the maximal converted amount rule and you’ll get only 50-100 dollars. With too defensive a strategy you’ll lose all bonuses before meeting the wagering requirements. Finding optimal strategy just by experience would be too inaccurate. To find the optimal strategy I have reverse-engineered 2 NetEnt slots (high variance with 98% and medium variance with 96% RTP) and carried out a lot of simulations. 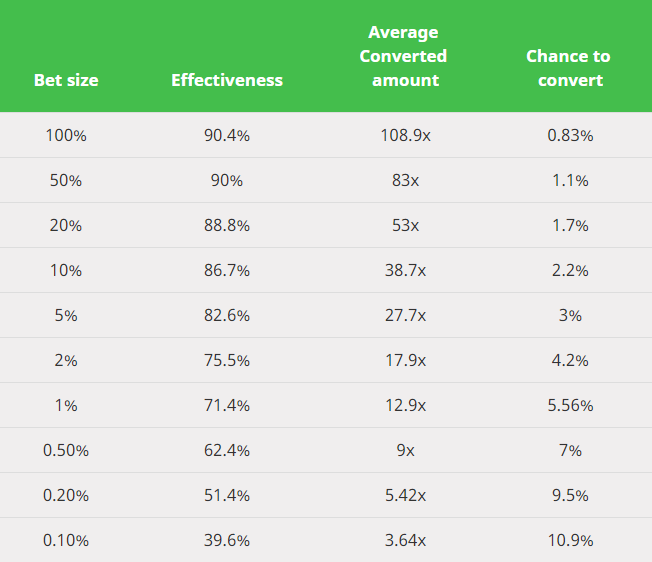 I have also modified those slots to 92%, 96% and 98% payout to observe the influence of RTP on your chances to win. My methodology: Imagine a player who starts with a bonus with value $100 which has 50x wagering requirements and maximal converted value $500. What percentage of a bonus will that player be able to convert if he bet X on certain slot Y? 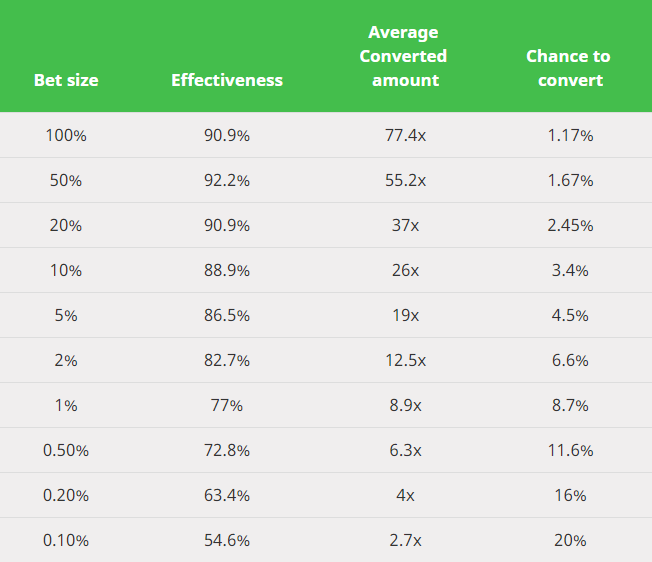 We calculate the converted percentage (later referred as EFFECTIVENESS) by simulating the situation 100 000 times. Playing a little with bet sizes around 0.50% of the original bonus value I have found out that the most effective bet in this case is 0.30% of the bonus. 0.30% of $100 bonus is $0.30. I state bet size in % of bonus as chances are equal for $0.03 bet and $10 bonus and for $0.30 bet and $100 bonus. What patterns have I observed? If maximal converted value is 5x bonus then a medium volatility slot is doing a little better. RTP is the most significant indicator for the success so you should pick your slot by RTP. 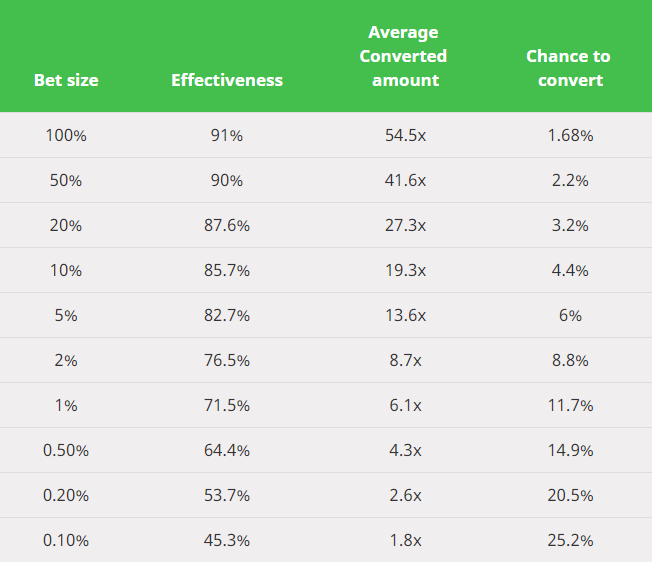 Higher RTP works more effectively with lower bets. Same is true for the slot volatility. Now imagine that you win in free spins $2 and your max. win is restricted to $50. The situation is a lot different as now you can cash-out up to 25 times of the original bonus which favors more high volatility games. You can see that the effectiveness is crazy when you have no bet limit or very high bet limit. 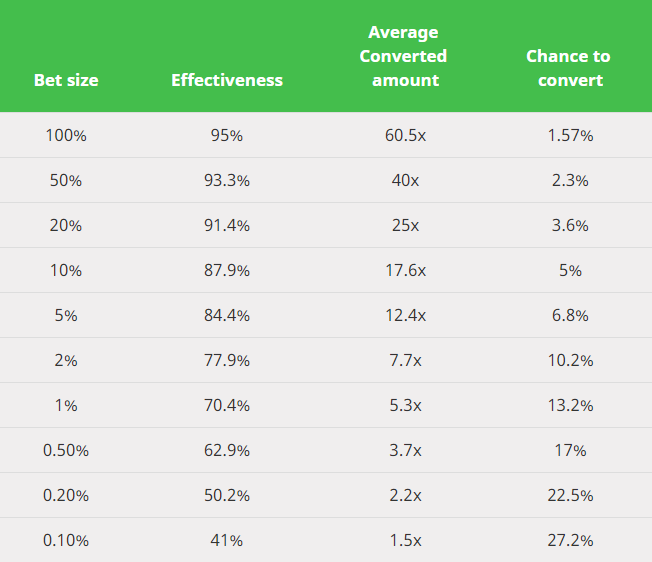 But also the chance to convert one bonus is very low: while for $100 bet on 98% RTP high variance slot it’s just 1.1% for $1 bet on the same slot chance to convert is 8.85% with 79% effectiveness. Since the vast majority of no deposit bonuses have restrictions for maximal converted value I’m not stating the chance to convert the bonus in the table. If you decide to choose a bet for optimal effectiveness then the chance to convert a bonus is also quite good. Conclusion: Free bonuses are a good option to make some money for a coffee or beer. But if you are eager to win more money (for a nice new bicycle for example) then read my next chapter which focuses on real bonus hunting. I’ll show you now a bonus hunting technique which should still work. BUT at the same time I MUST WARN YOU that this technique is much riskier and requires much more work and knowledge than bonus hunting 15 years ago. You deposit $100 and get for example $200 to play with. Let’s assume that WR are 35x$200. You start playing with a more aggressive style until you lose everything or multiply your bonus balance many times. Let’s say that you get to $5000 or more. You continue playing. Your buffer should be big enough to comfortably meet WR. 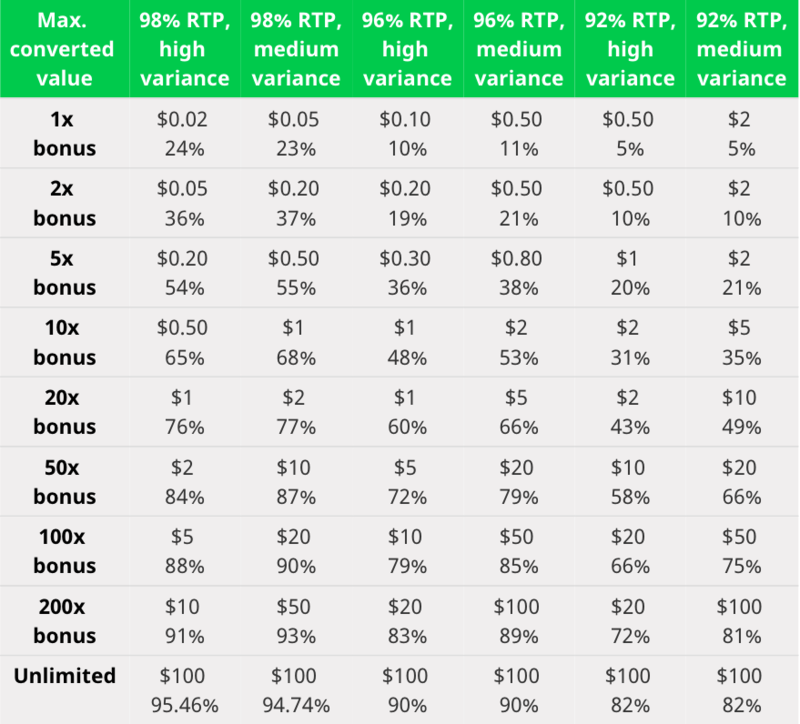 If you play normal 100% up to $100, 35x WR welcome bonuses with $10 bets played on 96% high variance slot then (according to my simulations) you convert on average 80% of the bonus value. That’s $60 made in the long run on every bonus. "Great, this will this be my new moneymaker?" "Are there any strings attached?" "When I buy a new bicycle with my winnings, what color will it be?" Yes, it does sound awesome. Depends on your decision, current bankroll and dedication. Yes there are some and quite important BUTs. So where are the potential problems? You have an advantage on your side but you can be unlucky as well. 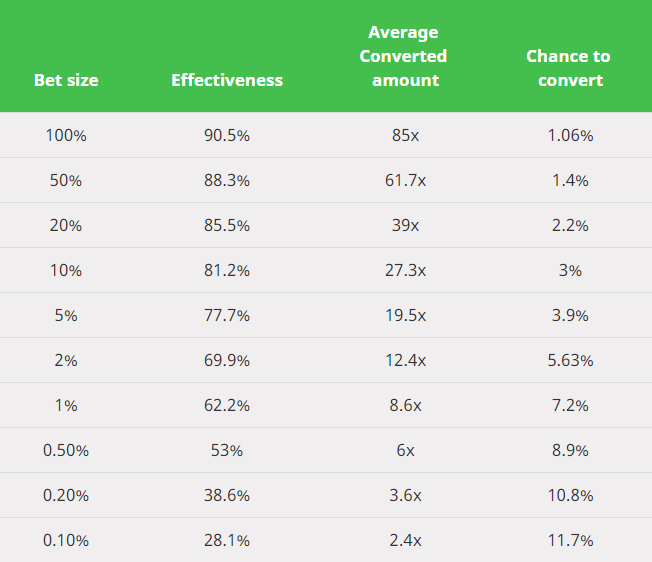 Your chance to convert $200 bonus from the example above is around 4.9%. If you are very unlucky, you can make 50 attempts with no success. You need a big bankroll when you start, accept the risk and be prepared to repeat this with 50-100 bonuses. Also your real converted value of a single bonus can vary from few hundreds up to few tens of thousands. 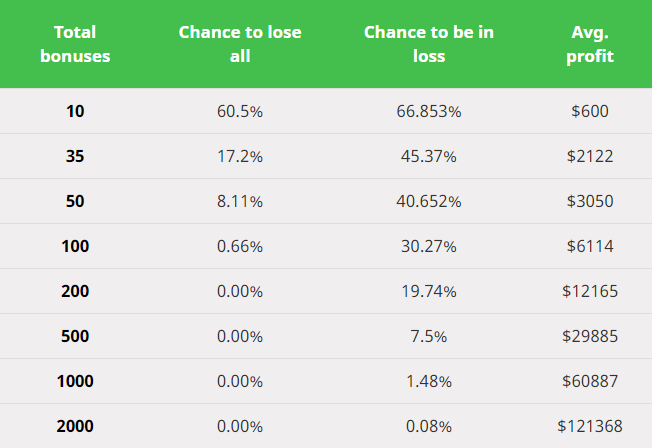 Following table displays your approximate chance to lose all N bonuses and your chances of experiencing a loss after N attempts. For the simulation I have used my reverse-engineered 96% high variance slot. Despite the fact that average profit correlates with the number of bonuses played, your chance to be in total profit grows quite slowly. After 200 correctly played bonuses there will be still almost 20% of players who will be in the red. Other players will make more than average but that won’t help you much if you are among those 20%, have spent weeks on chasing bonuses, and ended up in loss just due to bad luck. And you may also run out of the bonuses – there are many hundreds of casinos but not many thousands of them. My conclusion is that you should have at least $20000 to have a reasonably low chance of failure. Or you can either start with the best bonuses or take lower bonuses, choose slot with medium to low variance and try to build your bankroll gradually. Bonus hunting of 15 years ago didn’t have this problem at all. You were getting profit from every bonus you played. If you are looking for a way how to win at the casino every time nowadays, you are simply out of luck. Unfortunately, there is no such thing anymore. Now imagine that you have started to play this bonus hunting game. After 40 bonuses and $4000 lost you finally hit $7000 in one of the casinos. Will they pay you? If you were really careful and haven’t broken any specific rule from bonus terms and conditions then the casino will most likely pay you at the end. But sometimes you’ll probably need to make your case public on one of the mediation forums like Askgamblers and escalate….sometimes repeatedly. On the one hand a good casino manager may notice from your betting style that you are a bonus hunter. Your style with higher variance will differ a little from the style of casual players who are just killing their time in the casino. But most of the casinos will pay despite they think that you are a bonus hunter. They don’t want to risk their reputation for few thousand dollars. "If we notice any kind of irregular play with bonus (a.k.a. 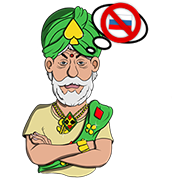 bonus hunting) we reserve the right to void the bonus"
Some casinos managers confirmed to me that after they introduced this clause that it gets rid of most bonus hunters almost instantly without doing anything else. I haven’t seen so far that any reputable casino would use this in case of dispute on some mediation platform. But the risk is still considerable. At the end the casino has the money in its account. If the casino decides to risk its reputation and not to pay you, you simply won’t get paid. No need to tell that 40 other casinos won’t return you your deposits either. If you want to decrease the chance of being accused of bonus abusing by displaying irregular play then you must avoid making an obvious change in your game style. Or at least make attempts to disguise it. An example for this would be to decrease your bet size to 10% of former bet size after you win high. Keep the same bet even after you win high and don’t give the casino an excuse not to pay you. This will increase the volatility of your betting strategy but not that much as you might think. And your long-term profit remains same. My simulation shows that dropping bet size after a big win to 10 % will decrease your chances of going bankrupt with $5000 budget from 36 % to 27 %. Dropping bet size after a big win to 10 % will decrease your chances of going bankrupt with $5000 budget from 36% to 27%. As you’ll need to play hundreds of bonuses you can’t be overly picky about casinos. But be especially aware of very small casinos with low revenues. Small unknown casinos can have monthly revenues of around $10 000. If a casino manager has a choice either to not pay to his employees or to not pay to some bonus hunter, guess which choice he will choose. You should also keep in mind that you can’t choose the casino in which you’ll manage to convert your bonus. 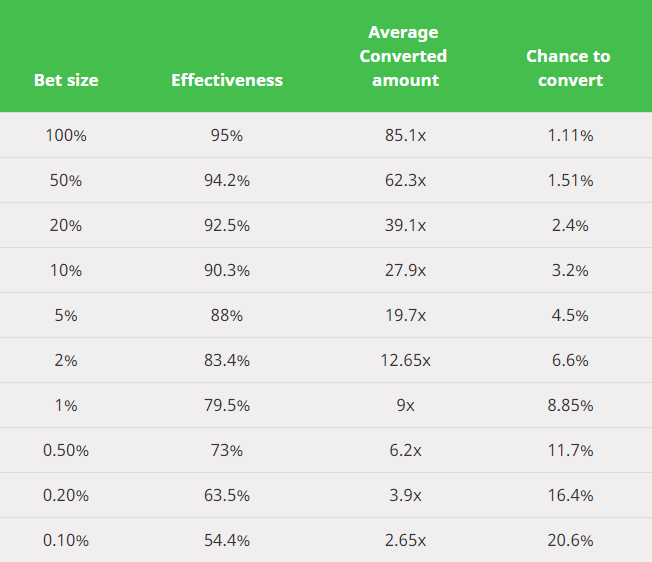 Which casino - out of all the casinos where you deposited - will be the one where conversion is successful is of course going to be decided by pure chance. Carefully read and understand the terms and conditions of bonus offers and casinos which offer them. Ask the casino to explain any ambiguous conditions and save the chat/email as evidence for the future. Choose the most suitable - and allowed - combination of slot and betting strategy. 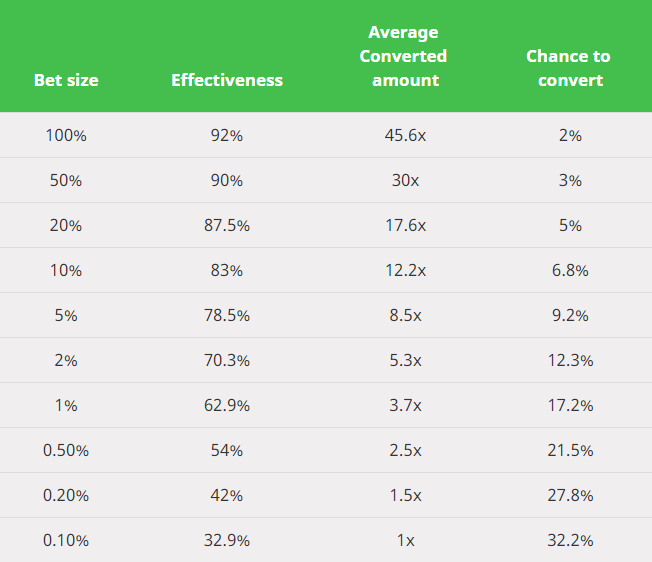 Decide whether the bonus on offer gives you a sufficient statistical advantage. Evaluate a casino’s reputation and again decide whether to play the bonus or not. Escalate and argument on mediation websites if a casino refuses to pay you out. And even if you are good at all of the above, it will take you probably hundreds of hours to make some reasonable money. That is the main reason why I’m not doing this myself: with my skills I can make the same money in different activities (software development for example). If you think that you can properly do everything described above I may have a better job for you ;). This is more likely to be a problem if you reside in one of countries where gambling is illegal or strictly regulated, or if you reside in country which is well known for bonus abusing. In this case, your choice of casinos and bonuses is limited and you’ll never find the hundreds of bonuses required to play this strategy. Is the bonus connected to a deposit? This is a condition which is much more important than it looks at first glance. If your bonus isn’t connected with a deposit then you can play with your real money without restrictions. If you are lucky, then you can forfeit the bonus and withdraw your win. If you are not lucky then you have a follow-up 2nd chance with the bonus. If you have a bonus which is NOT CONNECTED TO A DEPOSIT then neither maximal bet restrictions nor game restrictions will be applied for RM play. The biggest advantage is that you don’t need to increase your bankroll that aggressively as you don’t need any buffer for fulfilling the WR. I would recommend you to spin with 5% of your real money per round on any medium variance slot with high RTP. Withdraw when you increase your bankroll more than 7 times. What’s really great about this type of bonus is that you statistically lose only a small part of your deposit (8-16%). Then you have the whole bonus to compensate it and make profit. That is truly a game changer – even a 25% bonus with 50x WR should be profitable in the long run under these circumstances. 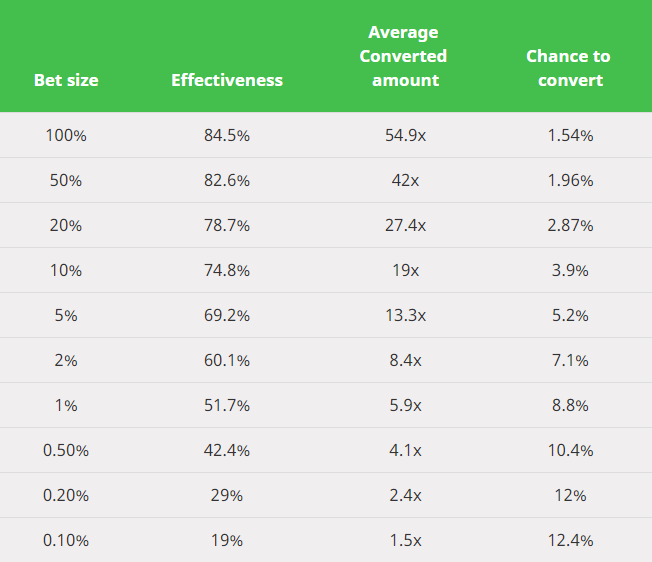 Bonus size determines your buffer for wagering. You lose money by spinning and you gain money when you get the bonus. If bonus is played together with deposit, then bonuses below 25% are usually not profitable. Profitability of bonuses in range 25%-90% depends on bonus size and your options for how to play them. Bonuses over 90% are usually profitable. Bonuses over 90 % are usually (not always) profitable. The profitability of lower bonuses generally depends on the WR and other factors. This restriction is usually applied on bonuses not connected to deposit. If you come across this rule for bonus connected to the deposit the best advice is to keep hands off. An optimal way to play this bonus can be found in my how to play no deposit bonuses section. Maximal bet restriction prevents you to play betting strategy with extremely high volatility. Maximal bet per line prevents you from increasing game volatility by switching to 1 line. Maximal double-up bet prevents you from regulating game volatility by doubling up your win until you lose or win a really high amount. Game restrictions prevent you from using either the most volatile slots or table games with very high RTP (like Blackjack). "If I start with $100 and spin $5 on Starburst, what is my chance to convert the bonus? What will be the average amount which I reach when I meet WR?" It’s a very difficult question to answer. In fact not one to ultimately answer here and now… but when CasinoGuru grows its audience we’ll look at creating an online simulator ;-). Until then you can try to use my tables at the end of this article. WR are still quite overrated… Maybe a relic from 15 years ago when they were a very important part of the bonus hunting landscape. With high-volatility bonus hunting WR just determine a relatively small part of your win which you’ll need to spend after you managed to hit a high win. Imagine that your goal is to get to $3000 or more from a $100 bonus. In this case the difference in expected converted amount between 25X WR and 100X WR with 4% house edge is just $100 vs. $400 out of more than $3000. It’s considerable but not extremely important. Your goal in this type of bonus hunting is to strike a balance between statistical profitability on one side and the risk of either bad luck or the casino won’t pay you on the other. Pushing volatility to extreme levels unnecessarily increases 2 previously mentioned risks. And as my simulations show you can comfortably achieve profit anyway without pushing too much. RTP is usually published by the slot producer. Check the pay table and how much the full line of major symbols pays. 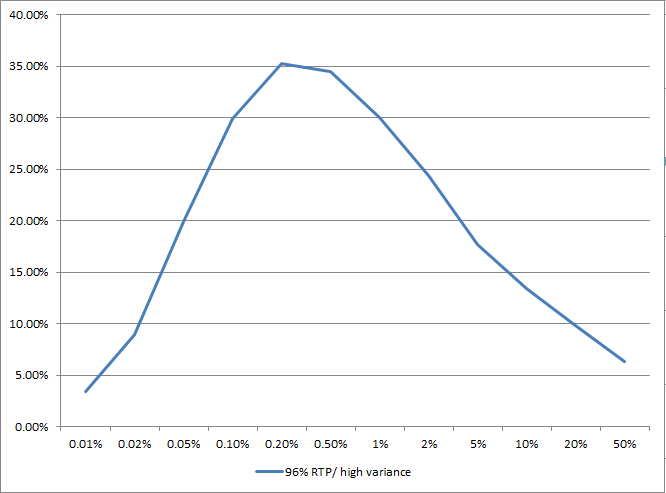 My simulations show that for bonus hunting the most suitable slots are with medium or high variance and RTP over 96% (RTP is a very important factor). I was very surprised when I found out that it’s not necessary to push volatility into extreme levels – you are more comfortably profitable if you keep a reasonable balance, and your game style will be much closer to the style of a casual gambler. 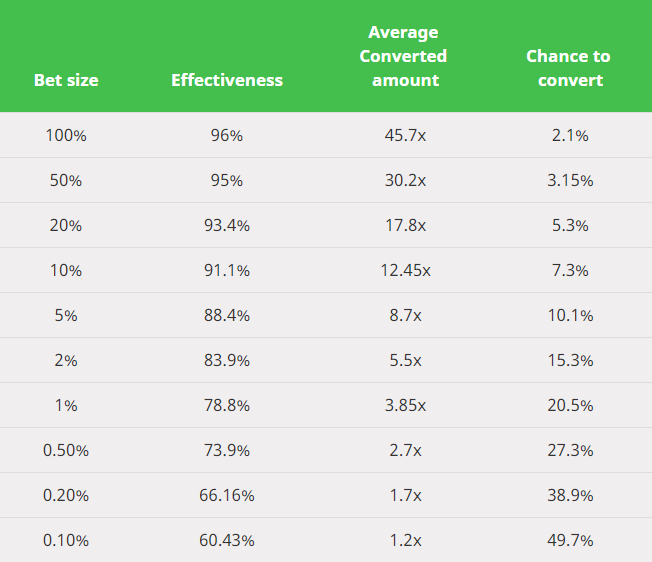 After you have determined the slot RTP and estimated its variance, then check the following tables to choose the suitable bet size. Tables at the end of this article will give you an idea about your chances. Some slots have a feature which allows you to double your win or lose it with chance 50:50. This is the ultimate feature to regulate the volatility of a slot game: simply double up until you win high enough or until you lose. And since the chance is 50:50 you are statistically not losing anything. 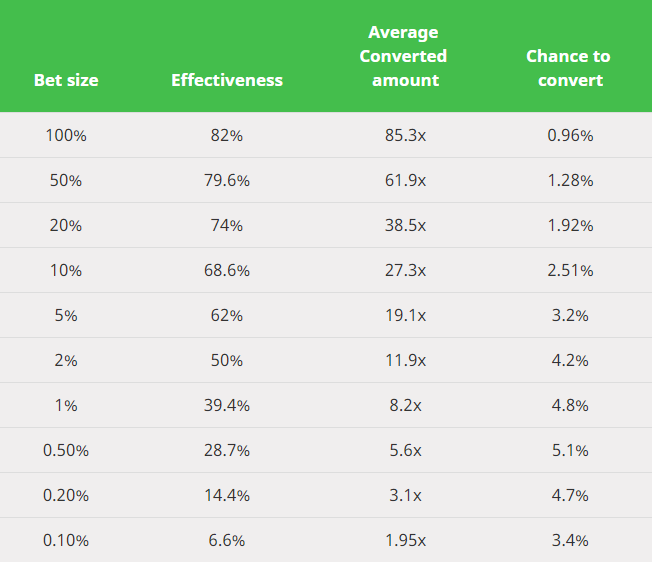 By abusing this feature you can theoretically reach effectiveness of bonus conversion close to the game RTP. But your playing style will be very suspicious. Be careful as this feature is usually prohibited or restricted in bonus conditions. If you play a slot with 20 winning lines and hit a winning combination only on 1 line, the win is split among the bet on all 20 lines. So even if that one line won 10 coins, the bet for the whole round was 20 coins and you actually lost 10 coins. This happens most of the time with the exception of some special slots with features which allow you to win on all lines simultaneously. The exact opposite is when you decrease the number of winning lines to 1. You either hit a combination which gives you 3-15000x of your bet or you lose. This trick increases volatility of the game 5-15 times (depending on the number of lines and other features of a game). 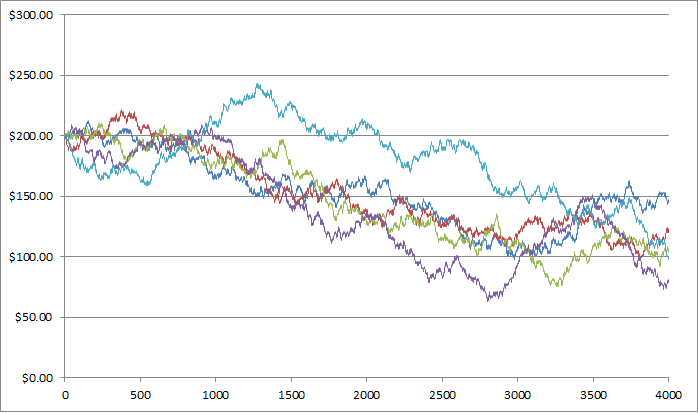 Note that with a lower number of lines the maximal bet allowed by game is usually decreased as well. However that is a good tradeoff if your maximal bet is already restricted by bonus conditions. Be aware that some casinos already know about this trick and restrict maximal bet per winline when playing with bonuses. If maximal bet limits are set as absolute values (max. $5 for example) you can increase your relative volatility by decreasing bonus size. So while $1000 bonus is not profitable, $200 bonus with all other conditions equal can be comfortably profitable. I think that high volatility bonus hunting is nowadays still possible but it definitely isn’t for everyone. It’s for experts who can perform the required math, who are willing to read tons of casino terms of service, and who have a big enough budget to fund temporary losses. I don’t see a bright one for bonus abusing. More and more casinos are fixing the last cracks in their terms of service, which is why casino winning tips such as those in this article might only work for a limited time. On top of that with increasing regulation the choice of online casinos will become more and more limited for everyone. Countries like Peru which a few years ago had almost no idea about online gambling are now founding their own regulators and stop respecting licenses from trustworthy worldwide regulators like Malta. Countries with freedom of speech like Czech Republic are adopting legislation for internet blocking like in Russia just to block foreign casinos and bookies. When most players end up with a limited choice of 20-30 casinos then the times of bonus hunting will definitely be over. 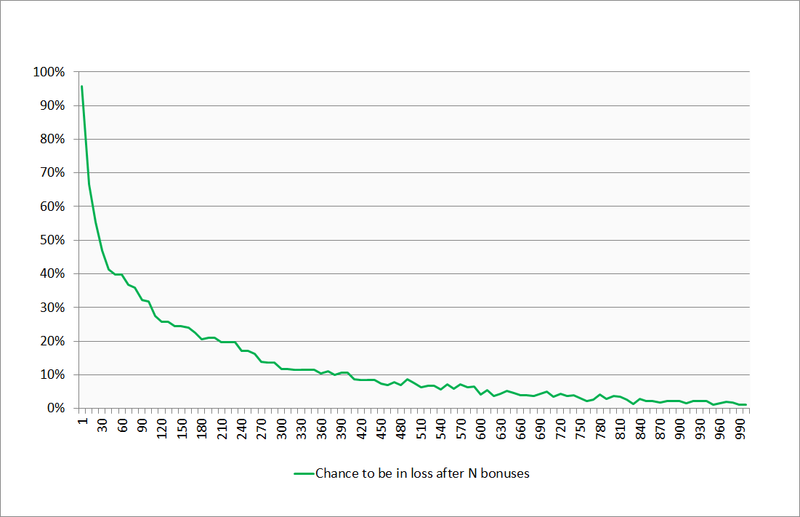 I have run a number of simulations to build a picture of the chances to convert certain types of bonuses. If you're looking for the best way to make money at casinos, these simulations might complete the picture. The best way to clear casino bonuses is right here. Each of the following 12 tables shows statistics for the combination of 25x or 50x wagering requirements and one of my 7 reverse-engineered slots. 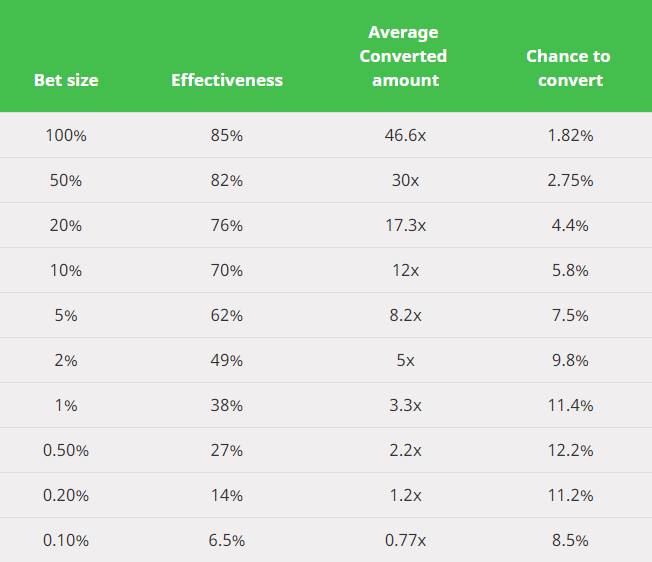 Average converted amount: denominated in multiples of original bonus value and expresses what average converted bonus can you expect. P.S. : medium/high volatility terms are not exact. If you want to be absolutely sure about the performance of specific slots then reverse-engineer them and make your own calculations. Slots with similar-looking volatility may differ in bonus conversion effectiveness at a rate of anywhere from 10-20%. I’m not publishing names of simulated slots on purpose - simply because I don’t want to encourage masses of players to get into bonus hunting. P.S. 2: Many thanks to Steve from Win money 101 dot com for language corrections. This article was really long one, the work he did was priceless.